Description : 263-264 p., [1 l. pl.] ; ill.: 1 photo. ; 24.5 cm. Subject : Lachrymal gland — Adenomatous polyp. Author caption: "Par A. de Montméja." Photo caption: "Planche XXXIV. — Tumeurs Des Sacs Lacrymaux." The clinical portrait represented by the photograph is of a 31 year-old male with significant tumefactions occupying both lachrymal sacs. Although the subject journeyed to Paris for medical treatment, he refused the surgical interventions which were offered to him, refusing, even, intubation or soundings with the Bowman probe. 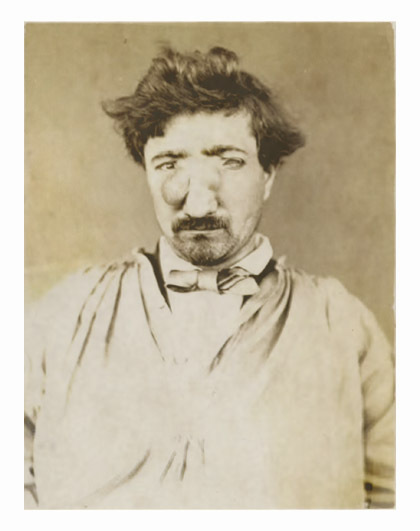 Diagnosis by palpation: mucous polyp of the nasal fossæ – polype muqueux analogue à ceux qui se développent d'ordinaire dans les fosses nasales.